We’d love your help. Let us know what’s wrong with this preview of Manituana by Wu Ming. To ask other readers questions about Manituana, please sign up. There was no room for the past in America. There is an irony in that statement, rhetorical as it might be. It is exactly the surfeit of room which allows so much of America to malinger and multiply, to prosper and fester in equal parts. This is an epic book but it is a soft 5 on the GR scale. This is a collection of silences, omissions and unplayed notes: it is a Kind of Blue for the Vollmann set. They ran to save a clutch of souls from the Apocalypse. They ran, because it was written thus. Time w There was no room for the past in America. They ran to save a clutch of souls from the Apocalypse. They ran, because it was written thus. Time was ending, and everything was reaching its conclusion. Otro libro para la lista. Después de leer 54 y enterarme que habían liberado de forma gratuita la traducción de su último libro editado en español, me entraron ganas de leerlo. La suerte es que lo había incluido en mi antibiblioteca el verano anterior. Sinceramente la novela es otro hito en la trayectoria del grupo de escritores Wu Ming, sigo teniendo muy buen recuerdo de Q y creo que esta está a la misma altura que este. Aunque según escribo esto, pienso que puede tener partes mejores o peores q Otro libro para la lista. Después de leer 54 y enterarme que habían liberado de forma gratuita la traducción de su último libro editado en español, me entraron ganas de leerlo. La suerte es que lo había incluido en mi antibiblioteca el verano anterior. Sinceramente la novela es otro hito en la trayectoria del grupo de escritores Wu Ming, sigo teniendo muy buen recuerdo de Q y creo que esta está a la misma altura que este. Aunque según escribo esto, pienso que puede tener partes mejores o peores que Q. En general una novela de 5 estrellas. Además Wu Ming se despliegan en todo su esplendor mediático con una completa web dedicada al libro, con una serie de mapas para activar en G**gle Earth, con un audio libro (en italiano) que sirve de prolegómeno y cuenta la historia del jefe indio Pontiac, con un nivel 2 de información que se activa al responder una pregunta sobre un personaje del libro, en general espectacular. Sinceramente este libro me ha ayudado a conocer por qué los nativos norteamericanos fueron masacrados de esta forma por la nueva nación (como ejemplo la carta real de George Washington donde pide destruir y eliminar todas las aldeas indias entre Nueva York y los grandes lagos). Es increíble saber como las comunidades mixtas de europeos y nativos que se estaban creando antes de la guerra de la independencia desaparecieron. En conclusión un desastre. Como todas las novelas de Wu Ming, hay que ser paciente en las primeras páginas, normalmente la sensación es que nos hemos perdido 50 páginas y que la historia ya ha empezado sin nosotros. Aquí, hay que añadir la dificultad de los nombre de los indios. Al estar bautizados tenían nombres cristianos e indios a la vez, y éstos además eran muy largos como: Philip Lacroix Ronaterihonte o Joseph Brant Thayendanega. Y por supuesto recordaos de nuevo que podéis descargar de forma gratuita y legal el libro completo en español en formato PDF y ePub. Considering the brutality of some of the deaths, and the knife-edge being trodden, I felt I was handling something fragile, delicate. The dying days of an indigenous people amongst the fratricide of revolution and war. A noble people both familiar yet slightly alien treading with care on clouds. Heroes with names that seem to have come down from some time of legend striding across a land that rings with fabulous names; Ronaterihonte and Thayendanegea, Canajoharie and Cayuga. In sharp contrast th Considering the brutality of some of the deaths, and the knife-edge being trodden, I felt I was handling something fragile, delicate. The dying days of an indigenous people amongst the fratricide of revolution and war. A noble people both familiar yet slightly alien treading with care on clouds. Heroes with names that seem to have come down from some time of legend striding across a land that rings with fabulous names; Ronaterihonte and Thayendanegea, Canajoharie and Cayuga. In sharp contrast there is the chapter where Warwick holds a soiree in honour of the Iroquois representatives in London. Here a surreal menagerie of painted, odiously smelly aristocrats promenade and preen in a room infested with rats. The women wear dresses so heavy that they have to be supported by outrageous wheeled contraptions. How very alien is London in 1775. The contrast between Iroquoisland and London has a bizarre quality about it that rings true. Mohawk Indians discuss Voltaire and Shakespeare with the nobles of the city, in surroundings that are both glamorous and decadent at the same time. The down-to-earth, life-on-the-edge, in touch with nature of the Mohawk Valley contrasts with the artificial, painted superficiality of "civilisation". Here we have a vision of a world that is to be lost; a young world, a wild world, yet closer to Eden for all that and not peopled by savages but nobles of a different cast. Here is a vision of the world that will replace it, drown it in ordure and stench. There is a meditative mood throughout; contemplative. One feels one is eavesdropping on quietly-spoken conversations in small rooms or corners, on thoughts and dreams and fears. There is a sense that this is a "coming-of-age" tale but without a happy ending. And so back, back to America where the theme is fire and the flames burn - not simply the inferno consuming Manhattan but also the fires of hate fuelled by greed and intolerance and war. The quiet world, the harmony, is being upset by disease, by fear, and by the White American greed for land, where the Indians are seen as vermin, an inconvenience, a stumbling-block. Calmness still presides, but for how long? The young warriors strain at the leash... And then it erupts into blood and splintered bone, pain and death amongst the chaos of leaves and trees, madness and refugees... and it isn't just men that die in the violence. This book is terrific, the best book of this sort that i've read in a very long time. It extremely well written, and perhaps a fifth name should be added to the four, the translator Shaun Whiteside. The translation is beautiful, it seems tight and quite transparent to the original. It makes real both a time and a place now lost, and then ... the story shifts again in dramatic ways you'll not forget. Strongly based in historic events, the story involves individually the life and development across a whole group, through worlds you'll not expect, with the recreation of this group of people most riveting. The history while very real recedes to background. The story is divided into three main parts, a time before and leading into war, a bizarre and troubling time in England, and then in the chaos and brutal dissolution of war. (Warning: At points this book describes brutal combat, murder and torture.) The story really hangs together, and takes you inside the lives of these people. This book makes clear that the time that marks the "birth of our nation" was also the time that marks the death of the nation of the Iroquois along with the destruction of their whole way of life, the Iroquois with a history longer than that of the U.S., with the expropriation of their land and with mass extermination through starvation, disease, mass murder and institutional genocide. This book makes real that the horror, meaning and finality of this complete inversion was blazingly apparent to the few Iroquois who eventually survive. This book also makes very clear that the war we call the "War of Independence" or the "Revolutionary War" was really just a civil war. It was a civil war among the colonists, it was a civil war among the native peoples, and a civil war between all these groups. The book also makes clear the parallel with those who rebelled against King George inside England around this time. [I had no knowledge of this before reading this book.] I was also surprised to find another book that understands and examines the Somerset decision and it's perverse influence on 'the founders'. See my review of Slave Nation by Alfred and Ruth Blumrosen. A small specific: Notice while you read how the momentary break in narration from third person omniscient to first person (near the end) creates an exciting and dramatic break, something other authors can observe and experience. I read elsewhere in a review that what the authors wrote was referencing in metaphor the invasion and occupation of Iraq and Afghanaistan. This review has things reversed, it's George Bush and the Bush administration that repeat and recreate! The book will take persistance for most readers. It also helps if you have a background in central New York native history, Five/Six Nations etc, as i do. You likely will need to look up some of the history as background. Definitely recommended. Following on from Q (authored as Luther Blissett) and 54, comes a new novel Manituana by the Bologna fiction collective known as Wu Ming. Verso are publishing Shaun Whiteside’s English translation, the proof copies were circulated last month, and the book will be available in both the UK and the US shortly. Like the earlier tomes by the same authors, Manituana is a heavily researched historical novel that speaks as much about a future we have yet to make, as the past in which it is set. The main Following on from Q (authored as Luther Blissett) and 54, comes a new novel Manituana by the Bologna fiction collective known as Wu Ming. Verso are publishing Shaun Whiteside’s English translation, the proof copies were circulated last month, and the book will be available in both the UK and the US shortly. Like the earlier tomes by the same authors, Manituana is a heavily researched historical novel that speaks as much about a future we have yet to make, as the past in which it is set. The main action takes place around the ‘American War of Independence’, with the focus on the alliance the Iroquois Indians made with the English. The Iroquois way of life was destroyed by the development of capitalism, and this entailed the exploitation of both Africa and the Americas, as well as the European working class. The diseases that accompanied European traders and their goods decimated the indigenous American population and thereby opened the way for their conquest. The Iroquois were caught between a rock and a hard place and mostly chose to ally with ‘perfidious Albion’, rather than the equally barbarous French or – slightly later – the genocidal armies of George Washington. However, for me the real ‘heroes’ of this novel are not the characters who take up the bulk of its pages (some are actual historical figures), but rather those shadowy proletarian figures who attempt to make an alliance with the Iroquois when some of their leaders visit London. "Corsero attraverso la piana e nel fitto degli alberi, incalzati dal crepuscolo e dalla sorte, un'armata di cinque uomini e molti fantasmi. Corsero per salvare un pugno di anime dall'Apocalisse. Corsero, perché così era scritto. Ora che il tempo finiva, ogni cosa trovava compimento." Manituana is definitely one of the best books I read in the past year and one that I will remember and think of for a long time. This is the first book I read by the Italian collective Wu Ming and I am pleasantly surpr "Corsero attraverso la piana e nel fitto degli alberi, incalzati dal crepuscolo e dalla sorte, un'armata di cinque uomini e molti fantasmi. This is the first book I read by the Italian collective Wu Ming and I am pleasantly surprised by the power, consistence and beauty of the narrative composition of this group of writers. They offer an alternative perspective of the historical events of the American War of Independence, without the claim of writing an accurate historical reconstruction of the events, although the book is heavily researched. 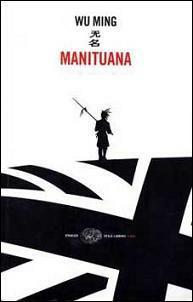 While other reviewers described Manituana not as consistent in the language and style as other Wu Ming’s works and, at times, even boring, I found it, instead, easy to read despite its complexity, and the variation of register functional and clever. It is one of those stories where a captivating plot, history and passages of great lyricism intertwine to shape a great novel. Un romanzo molto interessante per guardare la guerra d'indipendenza americana da un diverso punto di vista (quello della Nazione Mohawk e degli altri nativi che, insieme a loro, costituiscono le sei Nazioni Irochesi). Nella mia idea (preconcetta? stereotipata?) indiani e uomini bianchi sono sempre contrapposti, con gli indiani nella parte delle vittime e tutti gli altri in quella dei carnefici; per tale ragione mi ha stupito molto leggere di un'alleanza politica e militare tra nativi e inglesi: Un romanzo molto interessante per guardare la guerra d'indipendenza americana da un diverso punto di vista (quello della Nazione Mohawk e degli altri nativi che, insieme a loro, costituiscono le sei Nazioni Irochesi). Nella mia idea (preconcetta? stereotipata?) indiani e uomini bianchi sono sempre contrapposti, con gli indiani nella parte delle vittime e tutti gli altri in quella dei carnefici; per tale ragione mi ha stupito molto leggere di un'alleanza politica e militare tra nativi e inglesi: forse, se la guerra d'indipendenza fosse andata diversamente, la storia dei nativi americani sarebbe stata molto diversa. Un tros de novel·la. Pura èpica històrica sobre els que les pelis yankis sempre han pintat com a els dolents: les nacions iroqueses que van donar suport a la corona anglesa a partir del 1776. Perquè gairebé ningú us ho explicarà, però la victòria dels "fills de la llibertat" de George Washington significava la carta blanca per a expropiar, saquejar les terres dels mohawks, oneides i seneques, eliminar-los de la faç de la Terra. Com deia un dels crits de guerra dels rebels: "Civilització o mort!" Many of the characters and events are real: the brother and sister central pairing of Molly (also Konwatsi'tsiaienni, or Degonwadonti) and Joseph Brand (also Thayendanegea) and much of their family are close to accurate in their outline (some details have authorial license taken – Joseph’s second wife Susanna died of TB in 1773, not smallpox in 1777, for instance), as are their links to the loyalist forces centred on the Johnson family (the leading member of whom was Molly’s husband/lover/partner, and their eldest son was, indeed, killed fighting for the loyalists near Philadelphia). But then Wu Ming have adopted this approach in each of the novels, where known figures and their lives ground the broader tale and its politics in a sense of historical verisimilitude. In telling the tale of the war from the perspective of the indigenous, this is a tale of those who lost doubly. The long relations and links between the people of Haudenosaunee and the British meant that the effects of colonisation were mitigated, but were neither non-existent nor necessarily ameliorated, but managed, in part because the indigenous were still the larger of the two populations and the Haudenosaunee had sided with the British against the French earlier in the 18th century. The historical evidence suggests also that the Haudenosaunee saw the prospect of unfettered settlement, as offered by those seeking independence, as more of a threat in part because the alliances of kin were not so well developed. Although this sense of a relationship-based alliance is clear in the novel, Wu Ming do well also to place limits on it and to show the British mistrust of and contempt for the First Nations peoples, a view shared by the majority of both ‘loyalists’ and ‘rebels’. One of the many impressive elements of the book is this complexity of character groups so that each has a rich set of likeable, unlikeable, complex and nuanced characters – meaning that the all-too-often simple stereotypes of politically charged and savvy novels are avoided, although the English aristocrats in the London soujourn (a visit Thayendanegea/Joseph Brand did make) are all fairly unappealing characters, unlike the close to lumpenproletarian Londoners calling themselves Mohocks who claim affinity and try to build, if not an alliance, a comradeship with the visiting Mohawks in a common struggle against oppression and wealth. Not surprisingly, the story ends badly, in defeat and expulsion, while the depravations inflicted on the Haudenosaunee by General Sullivan under Washington’s instructions are told in grim detail and leave us with a sense of a mission based in something close to what we would call genocide: the total destruction of a people, of an ethnic group. But it does not end hopelessly – Molly Brand and her niece Esther Johnson, who is not of First Nations descent, reside in Manituana, the Thousand Islands of the St Lawrence, and in doing so suggest a new and more subtle sense of indigeneity, Esther having rejected her English world for that of the people of the land. If the novel claimed realism rather than verisimilitude, this would be an anachronistic postcolonial image; instead it presages a different way of exploring the area’s colonial past. Era una delle massime di Winston Churchill. Come dargli torto? La Storia, come la conosciamo, volenti o nolenti è un insieme di date e fatti scelti dai vincitori. Sta poi allo storiografo proporre un'interpretazione di quei fatti. Sta poi allo scrittore offrire un punto di vista alternativo. Il più delle volte questo punto di vista alternativa esita nella risposta al dilemma "E se fosse andata a finire in un'altra maniera?" (cfr. La svastica sul sole o altre mille ucronie e distopie). Altre volte, mischiando sempre storia e fiction, il punto di vista è quello di qualcuno realmente esistito e poiché sconfitto, lasciati ai margini sia della Storia che della sua figlioccia storiografia. In questo filone si inserisce il romanzo dei Wu Ming, proponendoci quello "sguardo obliquo" che hanno assunto come stilema (http://it.wikipedia.org/wiki/New_Ital...) delle loro opere. Alzi la mano chi non pensa alla Rivoluzione Americana come a una netta contrapposizione tra madrepatria inglese e coloni ribelli, con tutto il cruogiolo di concetti che si porta appresso (libertà, autodeterminazione dei popoli, proprietà privata). Certo è che a pochi viene in mente che la guerra che portò all'affrancatura delle colonie americane dall'impero britannico fu in realtà una partita a tre (almeno all'inizio). E che questa partita a tre ha poi funto da base per il genocidio dei nativi americani, perpetrato nel secolo dopo dagli statunitensi. E quindi ci ritroviamo questo volume tra le mani, che narra la storia di Joseph Brant, indiano d'America che viaggiò fino a Londra per ricevere l'appoggio dell'impero nella guerra contro i ribelli americani, e di altri personaggi (molti realmente esistiti, altri finzionali e funzionali alla storia raccontata). Già questo rende il libro interessante: il concretizzarsi sotto i nostri occhi di una realtà storica tanto ovvia quanto sconosciuta è di per se sufficiente per rendere meritoria la lettura del romanzo. Ed è anche il motivo per cui apprezzo (e tanto) i Wu Ming. Al di là delle idee politiche che possono traspirare dalle pagine (vi è un netto orientamento anti-americano), la sola offerta di un punto di vista alternativo può indurre a scardinare il nostro sistema di pensiero convenzionale. Certo, mai come in altri romanzi loro che ho letto, le varie fazioni vengono descritte in maniera un po' manichea: ai decadenti britannici ed agli ingordi coloni vengono contrapposti gli spirituali nativi americani. E gli avvenimenti di fantasia sembrano quasi voler accentuare questa caratterizzazione piatta, fornendo un valido motivo alle azione più barbare dei nativi da una parte e rivelando la bruttezza d'animo dei coloni o l'inconsistenza morale dei britannici. Il che regala, alla fine della fiera, un retrogusto di "forzato" che stona con la grande coralità del romanzo. Ça va sans dire che fa parte del gioco, che quello che ci ritroviamo tra le mani è un romanzo storico non un libro di storia, che quella che ci viene offerta non è principalmente una ricostruzione storica dettagliata od una lettura storiografica (anche se entrambi presenti), ma una "suggestione" storica. Ed in questo il romanzo fa pienamente centro. La vera pecca, a mio avviso, è la pesantezza del romanzo stesso e la sua disomogeneità di registro. Non nascondo che dopo 150 pagine sono stato tentato di buttarlo dalla finestra. Fortunatamente, sarà che avendo letto altro del collettivo Wu Ming conoscevo l'andazzo, l'ho riposto per un paio di mesi. Per lasciare sedimentare quelle 150 pagine, che non sono altro che il preambolo, la costruzione della base di quello che verrà. Infatti, quando mi son deciso a riaprire il tomo, sono pressoché volato sulle pagine, portandolo a termine in un paio di giorni. Che dire? Se vi capitasse tra le mani, non disperate! D'altro canto, ciò che mi ha fatto storcere il naso è la disomogeneità della scrittura. Se le parti dedicate alla tribù Mohock di Londra (esistita veramente benché si possa pensare il contrario!) sono originali e giustificano il cambio della prosa, nel resto del libro si passa da descrizioni al limite del lirismo, ad argomentazioni macchiavelliche e riassunti temporali di vari mesi piuttosto asciutti alternati a passi veramente prolissi. Non so se questa disomogeneità sia dovuta alla scrittura a otto (?) mani, ma certo è che è la prima volta che noto una tale caratteristica in uno dei loro lavori. Pazienza, la prossima volta andrà meglio. Non esiste distruzione per chi comprende la legge del tempo. 1775, regione di New York, a sud dei Grandi Laghi. Due barbuti cacciatori di pellicce entrano nell’emporio di Molly Arendiwanen Brant. L’emporio sorge in cima ad una collina dalla quale si domina il fiume Mohawk. Stretti tra l’ansa del fiume e la collina, i campi e le abitazioni di legno, costruite sul modello delle Lunghe Case. Il territorio delle Sei Nazioni è una Lunga Casa: i Seneca difendono la porta Occidentale, i Mohawk quella orientale; al centro gli Onondaga custodiscono il Fuoco. Cayuga, Oneida e Tuscarora aiutano i loro alleati. Le tredici colonie nordamericane hanno da poco dato il via alla American War of Independence. La guerra dei sette anni si è da poco conclusa con la sconfitta della Francia. È la fine della dominazione francese in Canada. Ora i coloni non hanno più la necessità di protezione da parte del regno britannico e sono ancora più insofferenti dei privilegi che di cui gode l’Inghilterra, a scapito dell’economia e dell’autonomia delle colonie. Due anni prima, i Figli della Libertà hanno dato vita al Boston Tea Party. Le tribù della Lunga Casa si dividono. Oneida e Tuscarora si alleano con gli americani; i Mohawk, i Seneca, gli Onondaga e i Cayuga rimangono fedeli agli inglesi, sperando di mantenere i propri territori. Sappiamo come è andata a finire. Inizia così la diaspora delle tribù e la fine della Confederazione della Lunga Casa. Parte dei Mohawk e dei Cayuga si trasferiscono in Canada. Una parte degli Oneida raggiunge il … Wisconsin! This is not the story we learned in grade school about the Revolutionary War. In the 1700's the Six Nations of the Iroquois (Mohawk, Oneida, Onondaga, Cayuga, Seneca and Tuscarora) had a remarkably advanced system of laws. It was also a common practice to take captives from other tribes into their culture. The Six Nations lived peaceably with the white settlers and intermarriage was not unknown. Leaders of the Six Tribes met with and were respected by the British. However, as more and more white This is not the story we learned in grade school about the Revolutionary War. In the 1700's the Six Nations of the Iroquois (Mohawk, Oneida, Onondaga, Cayuga, Seneca and Tuscarora) had a remarkably advanced system of laws. It was also a common practice to take captives from other tribes into their culture. The Six Nations lived peaceably with the white settlers and intermarriage was not unknown. Leaders of the Six Tribes met with and were respected by the British. However, as more and more white settlers moved into the Indian territories, tensions arose. But even more complicating was the tension that was developing between the American colonies and Britain. The Indians did not understand the whites rebelling against the Great King in Britain. Chief Joseph Brandt as leader of the Mohawks finds himself in an increasingly difficult position. History slowly unfolds taking Joseph eventually to England for a meeting with the King. Part Two is an interesting, sometimes humorous, depiction of the Indians stay in England complete with British thugs posing as the "seventh nation of the Indian tribe". The last part of the novel dissolves into raw violence between the Indians fighting the Rebels. Peopled with characters as Ethan Allen, King George, and Sir William Johnson, the novel provides a wide panorama of the US fight for independence. Although somewhat difficult to follow at the beginning of the book (both the Indian name and the Anglo name is often used interchangeably), the story soon becomes gripping. The really short chapters seemed to fit the story perfectly. "Manituana" is an excellent example of how complicated history really is. Un po' impegnativo da leggere, ma vale davvero l'impegno. A mio avviso ha due grossi pregi: parlare della storia nascosta della guerra civile americana, quella dei vinti che non furono solo gli inglesi, ma anche i nativi, che, dopo i soprusi dei colonialisti, certo non potevano allearsi coi ribelli americani. E poi il notevole pregio di farti vacillare... cambiare idea... vivere i diversi punti di vista che possono condurre a una guerra, fino ad arrivare a interiorizzare il concetto per cui, in u Un po' impegnativo da leggere, ma vale davvero l'impegno. Chissà quante guerre dovremo vivere per poterci finalmente arrivare. The last 50 pages were full of graphic torture scenes and the whole middle bit was oddly slapstick & its plotline sort of left hanging, but the majority of this novel was a serious epic about the US revolutionary war from the perspective of Mohawk people aligned with the British. Really good (mostly-- the violence was gratuitous and disconnected from the majority of the narrative and made it almots impossible for me to finish) and an interesting perspective, kinda depressing, enjoyable but I The last 50 pages were full of graphic torture scenes and the whole middle bit was oddly slapstick & its plotline sort of left hanging, but the majority of this novel was a serious epic about the US revolutionary war from the perspective of Mohawk people aligned with the British. Really good (mostly-- the violence was gratuitous and disconnected from the majority of the narrative and made it almots impossible for me to finish) and an interesting perspective, kinda depressing, enjoyable but I'm not sure I'd honestly recommend it? The book for anyone, who want's to get into the mood for »Assassins Creed III«. Totally remarkable, how Wu Ming achieves to give you a alternative perspective of the Independence War. Commonly the roles are mostly fixed like this: the evil, monarchic, catholic Brits on one side, the good WASP Yankees on the other side, and the heathen and barbarous native americans here and there as spice in the story and general lurking danger. Not so here: Wu Ming reminds the reader, that history is never as ea The book for anyone, who want's to get into the mood for »Assassins Creed III«. Romanzo storico a tratti prolisso. Degni di originalità letteraria i brani e i dialoghi della banda di teppisti la "settima nazione", che terrorizza la Londra di fine '700. Mi piace pensare, ma non ho trovato nessun riscontro, ad un'associazione con il movimento degli "indiani metropolitani" di fine '900. Non era ciò che mi aspettavo, perciò si è rivelato una sorpresa! Più affascinante di altri romanzi sulla guerra di indipendenza, un punto di vista decisamente diverso e forse per questo più interessante. Manituana è un canto bellissimo. Pieno di odori quasi, perché non so, io mi sono sentita quasi accudita leggendolo, e oltre l'epicità della situazione (che secondo me non è poi l'intento principale, quello dell'epicità), mi sono sentita così in mezzo a degli esseri umani. La triste historia de la desaparición de un mundo mestizo de indios y blancos durante la Guerra de Independencia americana. La narración es ágil, los personajes y las situaciones, memorables. Sir Joseph Banks, il presidente della Royal Society, non era ancora arrivato. Così gli aveva riferito il maggiordomo dall’aria contegnosa e giallognola mentre lo faceva accomodare in anticamera. Washington Irving trasse l’orologio dal taschino e controllò l’ora: in effetti si era presentato in buon anticipo. Banks era uno dei membri anziani dell’accademia e Irving doveva incontrarlo per assolvere una delle noiose incombenze del corpo diplomatico americano del quale faceva parte lì a Londra. La smania di cominciar prima per finir prima, evidentemente, gli aveva fatto accelerare troppo il passo, procurandogli un effetto opposto a quello desiderato: avrebbe dovuto anche aspettare. Si dispose dunque ad attendere e cominciò a guardarsi intorno per individuare quale, fra i divani di velluto consumato, potesse venirgli più comodo. Scelse quello giallo, posto tra l’ampio bovindo e una porta socchiusa su un’altra camera. Avvicinandosi notò che al di là della porta tre gentiluomini discorrevano fumando la pipa. Dalla fugace immagine che colse passando davanti allo spiraglio aperto non avrebbe saputo descriverli, ma l’odore del trinciato era inconfondibile, speziato e rude, assai diffuso fra le persone meno abbienti: gli scienziati inglesi avevano gusti semplici. Irving udì anche uno scambio di battute. Il discorso dei tre gli pareva interessante anche se lambiccato, ma non era certo cosa degna rimanere a origliare, né l’americano poteva irrompere nella stanza pretendendo di partecipare alla discussione senza nemmeno essere stato annunciato. Anche se, da come sembrava andare la conversazione, qualcosa da dire in proposito lo avrebbe avuto. Una certa esperienza e conoscenza degli aborigeni d’America l’aveva col tempo maturata, tanto da comprendere come le opinioni sulle presunte caratteristiche animalesche che molti bianchi attribuivano loro erano spesso frutto di ignoranza o di interessi mercenari. Abbandonò l’idea di sedersi sul divano, troppo vicino alla porta, e si spostò verso la finestra, dove il suo sguardo venne attratto dal giardino. Un bel angolo verde, senza dubbio, curato e ampio. La scelta delle piante rivelava il giusto equilibrio fra tradizione ed esotismo. C’erano anche specie tipicamente americane, che gli ricordarono il giardino della casa dei suoi genitori. In particolare il Liquidambar styraciflua vicino al cancello era del tutto identico a quello al quale suo fratello maggiore William una volta lo aveva appeso, per fargli pagare pegno. William era sempre stato un burlone e Washington, in quanto ultimo tra i fratelli, era spesso la vittima designata. Complici la battuta sui “selvaggi” ascoltata in precedenza e la somiglianza del giardino della Royal Society con quello della sua infanzia, a Washington sovvenne un ricordo sepolto nella memoria molto tempo prima. Il ricordo di una storia narratagli dal fratello, non avrebbe saputo dire se vera o inventata di sana pianta. Una storia violenta. “Sta’ sicuro che se ti racconto questa, te la fai addosso dalla paura.” La luce sinistra negli occhi di William non era rassicurante, ma il piccolo Washington aveva fatto finta di niente. William gli aveva girato le spalle, addentrandosi in uno dei numerosi anfratti del giardino circostante la casa. Una delle macchie incolte e selvatiche che ricordavano i boschi del nord. Washington gli era andato dietro, fino a quando il fratello non si era fermato ai piedi di un albero contornato di cespugli fitti. Senza voltarsi aveva cominciato a parlare. William aveva riso: “Il selvaggio aveva adocchiato dei libri in un angolo del nostro carro, e aveva chiesto di vederli da vicino. L’Ingenuo di Voltaire, e anche qualcosa di Rousseau, credo. Papà se li era portati dietro per farmeli leggere in viaggio, ma quando l’indiano glieli aveva chiesti in cambio delle pellicce, era stato ben contento di cederglieli.” William aveva riso ancora e Washington gli era andato dietro, anche se non avrebbe saputo dire perché. Scambiare pelli d’animale contro libri non gli sembrava un’idea poi così stupida. “Ma ora viene il bello,” aveva continuato William. “Due giorni dopo io e nostro padre ci eravamo fermati a mangiare nel bosco. Ci aspettava un lungo tratto da fare e papà aveva deciso di riposarsi un po’ prima di partire. Io ero sceso dal carro e mi ero messo a giocare vicino a una fitta macchia di alberi. D’un tratto sentii un rumore, qualcosa si muoveva tra le fronde. Pensai fosse un animale e andai a vedere. Non avevo fatto nemmeno dieci metri addentrandomi fra gli alberi, che la luce si era già dimezzata. Quello che prima aveva contorni netti, un attimo dopo sembrava circonfuso da un alone tetro e vago. Seguii ancora per qualche decina di metri lo scalpiccio, fino a che non vidi qualcosa al limitare di una piccola radura, in campo aperto. Era davvero un animale, un cerbiatto ferito. Cercava di trascinarsi avanti, come se fosse braccato, ma le zampe posteriori erano spezzate e le forze lo avevano abbandonato. Ricordo ancora adesso gli occhi liquidi di quella bestia, e il tremore che le faceva sobbalzare tutto il corpo. A quel punto William aveva fatto una lunga pausa e si era avvicinato al piccolo Washington sussurrandogli all’orecchio: “E sai cosa accadde quando il mio inseguitore passò accanto a quell’albero?” Washington aveva provato un brivido. Aveva timore di sapere, ma non vi avrebbe rinunciato per nulla al mondo. Washington non aveva detto nulla, ma sentiva le ginocchia tremare e una strana eccitazione in petto. Era una storia fantastica e spaventosa, di quelle da narrare nelle notti tempestose. Il fratello si era avviato a lunghi passi verso la casa, lasciandolo da solo con gli occhi sbarrati. Le fronde degli alberi, scossi dal vento, sembravano volerlo ghermire per ingoiarlo nelle crepe dei loro tronchi. Il piccolo Irving aveva deglutito e si era messo a correre dietro a William, che di certo sghignazzava tra sé. I toni accesi della conversazione in corso nella stanza accanto lo riscossero dai ricordi. Banks sembrava tardare ancora, e così per ingannare l’attesa Irving cominciò a passare in rassegna i dipinti alle pareti, come si trovasse in un museo. I volti di Boyle, Newton, Locke, Bacon, Wilkins lo squadravano severi da sotto le parrucche. Gli tornò in mente, così come se lo era immaginato da piccolo, il ghigno del cavaliere nero, cristallizzato dalla morte nella sua ultima terribile espressione da “Lanterna Jack”. Tirò fuori dal panciotto una matita e un piccolo taccuino e annotò: Cavaliere decapitato. Continua a cavalcare senza testa. Un’immagine suggestiva per un racconto; aveva già il titolo: “La leggenda della valle addormentata.” Lo sussurrò tra sé, come per verificarne l’efficacia. Non c’entrava molto con il racconto del fratello, ma suonava bene e poi Irving era uno scrittore, dopotutto, e uno scrittore deve potersi prendere certe libertà. Ripeté ancora una volta il titolo, questa volta a voce alta. Si sorprese a sottolineare soddisfatto con la matita le parole appena vergate, dondolando avanti e indietro, inarcando la schiena come un bimbo con il vaso della marmellata appena rubato dallo stipetto della cucina. Si sentì vagamente a disagio per la sua goffaggine, mise via il taccuino e cominciò a camminare fino a spingersi di nuovo nei pressi della porta da cui provenivano ancora le voci dei tre uomini di sicenza. Con molta probabilità, i luminari oltre la soglia non avevano mai visto un indiano in vita loro, se non in qualche stampa, eppure parlavano di esperienza. Rimase pensieroso, impalato davanti alla soglia con lo sguardo basso. Non sentì Sir Banks avvicinarsi e quando le scarpe dello scienziato, che avevano una curiosa fibbia a forma di testa d’ariete, entrarono nel suo campo visivo, fece un sobbalzo. Le voci oltre la porta ripresero il filo del discorso con maggiore concitazione. Sir Banks inarcò un sopracciglio guardando perplesso Irving, che allargò le braccia. Il presidente della Royal Society spalancò la porta entrando nella sala. Da dietro la sua spalla l’americano vide le tre figure saltare in piedi dalle poltrone e impallidire visibilmente. Manituana è un romanzo storico scritto dai quattro autori bolognesi che si celano sotto il nome Wu Ming (che in mandarino significa anonimo) autori, sotto il "nom de plume" di Luther Blissett del famoso romanzo Q.
Manituana narra della rivoluzione americana, vista dalla parte dei nativi. Diversamente dalla agiografica storia ufficiale, il libro ci porta a conoscere le vere ragioni e le inaudite sofferenze inflitte ai veri padroni delle terre poi espropriate e cedute ai "valorosi combattenti per Manituana è un romanzo storico scritto dai quattro autori bolognesi che si celano sotto il nome Wu Ming (che in mandarino significa anonimo) autori, sotto il "nom de plume" di Luther Blissett del famoso romanzo Q.
Manituana narra della rivoluzione americana, vista dalla parte dei nativi. Diversamente dalla agiografica storia ufficiale, il libro ci porta a conoscere le vere ragioni e le inaudite sofferenze inflitte ai veri padroni delle terre poi espropriate e cedute ai "valorosi combattenti per la libertà". Sulla scorta dei saggi scritti dagli storici " eretici" tra cui l'autorevole Francis Jennings, di cui consiglio "La creazione dell'America", Wu Ming smaschera il mito fondante della nazione americana e ne rivela i lati più meschini e venali. Recommends it for: Folks who want a different look at the American Revolution. leave it to Italians to write about the American Revolution. And sure, it's interesting to see a book where the Americans are the bad guys, Wu Ming could've done a better job with it. The basic plot line is that Joseph Brant must muster his Iroquois to serve the British and protect native lands from the encroaching rebels. In it, we're introduced to a lot of characters from Revolutionary War history I forgot about, being not from New York and not as much of a nerd, relatively. The New York Germa leave it to Italians to write about the American Revolution. And sure, it's interesting to see a book where the Americans are the bad guys, Wu Ming could've done a better job with it. The basic plot line is that Joseph Brant must muster his Iroquois to serve the British and protect native lands from the encroaching rebels. In it, we're introduced to a lot of characters from Revolutionary War history I forgot about, being not from New York and not as much of a nerd, relatively. The New York German Protestant God-fearing Rebels are the bad guys, and they are a lot more interesting than Brant. Brant gets his Noble Savage on, though he does do a lot of really bad things, its pretty clear that the Americans do, too. But the whole "protecting our native lands" is thin, in a way: it seemed to me that the writers never really understood the natives that much, although the half-Indian, half-British Peter Johnson is perhaps the most interesting character in the book. Otherwise, the Indians are bold, the women are nubile, and the religious folks are roundly evil (again, this is written by Anarchists). I guess I was just expecting more. I loved Q's sense of place in the Reformation, and the main character's sense of huntedness and hauntedness. He was interesting to follow around Europe stopping the Papists. Here, we just have the sullen and stoic Brant. I suppose it was supposed to be a screed on the formation of America, but then I wish Wu Ming went more into the religious foundations of the US. Or how regional the conflict was, with Bostoners fighting for one thing, New Yorkers for another, and Carolinians for a third. If Manituana was supposed to be an expository on how nasty and destructive civil war can be, like Q was, then, well, it's overshadowed by folks who are much better at that. It's not bad airplane reading. It has a quick pace, lots of battle scenes, and is generally as light and readable as something about the extermination of a nation can be. I'll read more of Wu Ming at some point, but probably not for a while. But it is hardly the most impactful book I've ever read. Maybe Revolutionary War buffs or people who hate Imperialism more than me (or the middle of the Venn Diagram connecting those two) would get more out of it. But it's certainly nothing earth-shattering. Un romanzo notevole, che forse sono riuscito ad apprezzare ancora di più perché ho letto prima L'Armata. Si vede come questo testo sia una svolta del pensiero dei Wu Ming, mentre 54 lo era stato per il modo di scrivere e la struttura. E' un testo tragico, l'unico - forse - dei Wu Ming. Nessuno si salva, nessuno riesce a guadagnare la propria aurea eroica. Ogni personaggio, anche i più grandi, restano ancorati alla propria dimensione umana, la quale si macchia sempre di sangue e meschinità. C'è c Un romanzo notevole, che forse sono riuscito ad apprezzare ancora di più perché ho letto prima L'Armata. Si vede come questo testo sia una svolta del pensiero dei Wu Ming, mentre 54 lo era stato per il modo di scrivere e la struttura. E' un testo tragico, l'unico - forse - dei Wu Ming. Nessuno si salva, nessuno riesce a guadagnare la propria aurea eroica. Ogni personaggio, anche i più grandi, restano ancorati alla propria dimensione umana, la quale si macchia sempre di sangue e meschinità. C'è chi è peggiore e chi migliore, ma nessuno è davvero un eroe. Solo chi muore, forse, riesce a varcare quella soglia. Ma i Wu Ming li fanno morire in circostanze stupide, il che aumenta nel lettore il senso di disagio più che quello della grandezza. L'operazione portata avanti dai Wu Ming è necessaria: far capire alle persone che le grandi rivoluzioni che hanno aperto le porte alla modernità non sono state combattute sul monte Olimpo, tra armature scintillanti e gesti eroici, ma su questa Terra in mezzo al sangue, la merda, la puzza, agli interessi gretti degli uomini mortali. Che oltre all'ideale c'era anche l'interesse. E quest'ultimo è il motore della macchina che muove tutta la struttura, mentre l'ideale resta la carrozzeria scintillante che prende gli occhi su di sé. Una terza parte che da sola vale tutto il libro. Nel complesso mi �� apparsa un'opera sbilanciata. Le prime due parti mi sono sembrate appesantitite, credo che il narrato in esse contenuto, sia utile alla caratterizzazione dei personaggi e all'enfatizzazione del finale pirotecnico, tuttavia la sensazione di ���gonfiore���, non necessariamente utile al romanzo, rimane e forse qualche pagina in meno non avrebbe guastato. Di dubbia utilit�� il racconto delle vicende riguardanti ���la settima naz Una terza parte che da sola vale tutto il libro. Nel complesso mi �� apparsa un'opera sbilanciata. Le prime due parti mi sono sembrate appesantitite, credo che il narrato in esse contenuto, sia utile alla caratterizzazione dei personaggi e all'enfatizzazione del finale pirotecnico, tuttavia la sensazione di ���gonfiore���, non necessariamente utile al romanzo, rimane e forse qualche pagina in meno non avrebbe guastato. Di dubbia utilit�� il racconto delle vicende riguardanti ���la settima nazione��� cos�� come lo stile ���toscaneggiante��� adottato per narrarne le imprese. Manituana �� orfano dello stile ad incastro tipico dei tre romanzi corali precedenti. Gli autori, sono invece rimasti fedeli alla loro passione per il passato: con questo libro hanno spinto, secondo me come in ���Q��� se non oltre, sull'aspetto storico riportando in vita reali protagonisti degli albori della rivoluzione americana e trasmettendoci in differita gli eventi che ne hanno caratterizzato gli inizi. L'intreccio narrativo mi �� sembrato, nel suo insieme, meno efficace e avvincente rispetto a quanto ci avevano abituato gli autori, cosa che, secondo me, congiuntamente all'ambientazione della storia in un contesto geografico e culturale distante dal nostro, spiega il tiepido successo di questo tomo in Italia. C'�� da dire che, pur essendo a digiuno di cultura riguardante la storia americana, il testo ha avuto il pregio di accendere in me una ���fiammella��� alimentata poi dalla mole di informazioni e approfondimenti messi disposizione dagli autori nel sito ���manituana.com���. Having been bowled over by '54' from the four writers who make up the Italian collective known as the Wu Ming, a book which weaves a tale around the defeats and compromises of post-war Italian politics via a supporting cast including Cary Grant, Lucky Luciano and Tito, I was keen to get my hands on the English translation of their latest, Manituana. As ambitious in scope as their earlier novels, expertly translated by Shaun Whiteside, Manituana concerns itself with a period of history I was shame Having been bowled over by '54' from the four writers who make up the Italian collective known as the Wu Ming, a book which weaves a tale around the defeats and compromises of post-war Italian politics via a supporting cast including Cary Grant, Lucky Luciano and Tito, I was keen to get my hands on the English translation of their latest, Manituana. As ambitious in scope as their earlier novels, expertly translated by Shaun Whiteside, Manituana concerns itself with a period of history I was shamefully ignorant of until reading this novel, the bloody birth of the United States and the unravelling of alliances between the British Empire, its colonists and the Six Nations of the Iroquois. Again weaving the histories of real people - such as the Mohawk war chief Joseph Brant and his supernaturally-gifted sister Molly - into those of an array of allies and enemies, Manituana moves from the ancient forests of America through dank and dangerous London streets to Westminster audiences with British Royalty, before returning to the land so filled with opportunity that it seems it cannot be left in the control of its original owners for long. 'Fire gives life, and yet it consumes', remarks Joseph Brant's friend and ally Philip Lacroix, and those who set the fire are not always saved from the flames. As war becomes inevitable, no side escapes unharmed, atrocities and betrayals are met with fierce reprisals until the soil of the new country runs red. No hand remains unstained. The parallels between this beginning and more recent episodes of nation-building by Americans in Iraq have been commented upon by the writers. Promising to be the first of a trilogy of books to explore this perhaps neglected or airbrushed period of history, Manituana manages, despite achieving its epic ambitions, to be a fast-paced and entertaining read, one not to be missed. Now the only thing to do is wait patiently for the next part.
" - Non possiamo vincere, Molly, - disse Philip. - Puoi fermare le loro malattie, ma non il contagio che portano nell'animo. I bianchi ci distruggeranno come distruggono se stessi. Non fa differenza quale sia la bandiera. Sono un gorgo che si allarga e sprofonda ogni cosa. " Il romanzo rende palese il cattivo ascendente degli europei sulle fiere popolazione amerindie. Lo stesso Joseph "Thayendanegea" Brant, interprete delle Sei Nazioni e guerriero, soccombe all'odio prodigandosi in una feroce guerra di aggressione, non risparmiando alcuno sul suo sentiero di vendetta; tutto ciò, quando egli sente che il mondo sta per cambiare, ed in peggio per gli indiani. Suo fratello di sangue Philip Lacroix Ronaterihonte, detto Grande Diavolo, già ampiamente provato dall'acredine della vita, non si lascia, tuttavia, corrompere fino in fondo, manifestando a Joseph, fino alla fine, il pericolo del cadere vittima della sete di sangue. Nel suo animo alberga una furia, malcelata in battaglia, contro la quale lotta costantemente per mantenere il controllo. La tradizione dei nativi americani, benché sradicata, spezzata e dispersa ai quattro venti dalla cupidigia e dalla cortezza di vedute dell'uomo bianco, onanista e asservito al dio del profitto personale, ha, tuttavia, possibilità di essere preservata da eroi della mole di Molly Brant, sorella di Joseph, anziana sensitiva Mohawk. Dei suoi insegnamenti potrebbero far bagaglio le nuove generazioni; usi e costumi che sono lascito degli antichi padri, i precursori dei Mohawk il cui onore è andato in fumo, preda dei barili di rum e del fuoco dei fucili. E dell'odio. Tre stelle molto stiracchiate e un bel carico di delusione. Il romanzo non decolla; la trama - fin troppo lineare (ma certamente è stata una scelta) - appare assai diluita e senza sorprese. Come un bicchiere di rum con troppa acqua (tanto per citare l'alcolico amato dagli indigeni). Inoltre ho avuto la sensazione che il libro finisca senza aver spiegato tutte le potenzialità che il tema ed il genere avrebbero potuto offrire. Sono certo che tra qualche tempo del romanzo ricorderò solo quello che ant Tre stelle molto stiracchiate e un bel carico di delusione. Sono certo che tra qualche tempo del romanzo ricorderò solo quello che anticipa la quarta di copertina: lotte tra indiani e bianchi, lealisti e yankee, capanne bruciate di qua, fattorie assaltate di là, un viaggio a Londra, battaglie varie e un po' di politica. Sullo stile, a differenza del precedente e ben più sostanzioso "54", mi è parsa molto più evidente e mal amalgamata la presenza di differenti mani. La seconda parte, inoltre, è del tutto al di fuori del romanzo, tanto che saltarla a piè pari non condiziona minimamente la comprensione della trama (nonostante l'idea del mohock club a Londra non sia male). Non riuscito, infine, l'esperimento linguistico sullo slang della feccia di Londra, forzato, artefatto e poco verosimile. Per il resto il romanzo scorre e si legge velocemente ed alcuni passaggi sono scritti ottimamente, soprattutto il finale. aspetti. Di fronte a ciò appare più scontata la ‘storia raccontata dalla parte sbagliata’, in quello che è un western settecentesco raccontato dagli indiani, cioè dai perdenti predestinati. C’è un filo di antiamericanismo in tutto ciò – la guerra di Secessione vista come primo vagito dell’incontrollata fame di terre propria del diciannovesimo secolo statunitense e delle tentazioni egemoniche del ventesimo ma il racconto è per lunghi tratti appassionante, anche se il finale è bene o male scritto e questo procura un calo di tensione nel corso delle ultime cento, centocinquanta pagine. Bello l’aspetto sognante della spiritualità indiana, anche se alla fine, forse, la parte che resta più nel ricordo è la sezione londinese del racconto, con il pirotecnico linguaggio di strada dei Mohock londinesi. Wu Ming (extended name: Wu Ming Foundation) is the collective pen name of four Italian writers: Roberto Bui, Giovanni Cattabriga, Federico Guglielmi and Riccardo Pedrini, respectively known as "Wu Ming 1", "Wu Ming 2", "Wu Ming 4" and "Wu Ming 5". "Wu Ming" means "anonymous" in Chinese. Although their real names are not secret, the four authors never use them. The quartet was a quintet until 2008, Wu Ming (extended name: Wu Ming Foundation) is the collective pen name of four Italian writers: Roberto Bui, Giovanni Cattabriga, Federico Guglielmi and Riccardo Pedrini, respectively known as "Wu Ming 1", "Wu Ming 2", "Wu Ming 4" and "Wu Ming 5". "Wu Ming" means "anonymous" in Chinese. Although their real names are not secret, the four authors never use them. The quartet was a quintet until 2008, when Luca Di Meo aka "Wu Ming 3" left the group. Wu Ming had previously been using another pen name: Luther Blissett. Under that nom de plume, Wu Ming wrote the novel Q. “Solo crescendo aveva capito che la fede di Sir William era qualcosa che si stagliava al di sopra delle confessioni e allo stesso tempo le attraversava tutte. Nella sua valle c'era posto per chiunque. Il re d'Inghilterra e il papa erano molto lontani, e il Padrone della Vita adorato dai Mohawk non era indegno d'essere chiamato Dio, anche se ci si rivolgeva a lui in modi selvatici e pittoreschi. Fin da piccolo Peter sapeva che non tutte le cerimonie nella foresta erano indiane. La notte di San Giovanni, nel fitto della boscaglia, si accendevano piccoli fuochi e si parlava gaelico, celebrando messe che la luce del giorno avrebbe proibito. I profughi scozzesi e i coloni irlandesi di suo padre s'intendevano con dialetti antichi come le rocce. La Lingua della Notte. Sir William la usava quando voleva dirgli qualcosa di intimo, che gli altri non dovevano cogliere. - È la lingua della fede, del sangue e della guerra, - diceva. - Non la si parla per caso. L'inglese invece serviva a comandare, a scrivere e a capirsi da un capo all'altro della valle. A Philadelphia gli avevano insegnato anche il francese, la lingua del nemico.